Some of the links on this page are affiliate links. We may earn a small commission on purchases made through them. Our content is not influenced by commissions. The GTX 1060 is a great mid-range graphics card capable of running most AAA games very well. However, to get the most out of this card you need to pair it with a good CPU. In this guide, I will go over some things you need to consider before deciding on a CPU, I will then run you through some great CPUs to pair with the GTX 1060. For most people, the best CPU for a GTX 1060 is the AMD Ryzen 5 2600. It is very competitively priced and offers excellent value for money. It should have no problem running most games above 60 FPS and a lot of the time you will see a frame rate above 100 FPS. It can also be overclocked to get even better performance. This CPU is great for multi-tasking and streaming too with 6 cores and 12 threads. There are a few CPUs that are great to pair with a GTX 1060. Before we look at these CPUs there some things to consider to make sure you choose the best processor for you. The games you play most – Before deciding on a new CPU, it’s worth checking out the benchmarks for the specific games you like to play. Some games will run better with one CPU, and others will run better with a different CPU. You should be able to compare benchmarks for most popular games with a quick google search. Monitor resolution and refresh rate – When you’re looking at the benchmarks for the games you play, take into account your monitors resolution and refresh rate. For example, if you have a 60hz monitor, you won’t see much difference between a relatively low-end CPU capable of a steady frame rate of around 60 – 70 and a high-end CPU capable of a frame rate of 100+. This is because the monitors refresh rate will be a bottleneck. Although if you think you will be upgrading to a monitor with a higher refresh rate any time soon, you might still want to invest in a higher-end CPU for future-proofing. Games released in the future will likely require more powerful processors too. Motherboard and RAM compatibility – You need to make sure the socket on your motherboard is compatible with the CPU. If you don’t know already, you should be able to find out which socket your motherboard has on the manufacturers website. Unfortunately, upgrading your CPU often means you need to get a new motherboard too, especially if it is a big upgrade. As long as the CPU is compatible with the motherboard, it should be compatible with the RAM. There are a few exceptions though, so it’s worth double checking. Will you be streaming or multitasking? – When it comes to pure gaming, Intel processors usually have a slight edge over similarly priced AMD processors. However, AMD processors are usually a better choice if you plan on doing a lot of multitasking or if you will be streaming. Future-proofing – Another thing to consider is whether or not you want to pay a bit more for a higher-end CPU that will be more future-proof. If you think you will upgrade the your GPU any time soon then it’s definitely worth considering. Below are our recommended CPUs for a GTX 1060. These processors will perform very well with the GTX 1060 without bottlenecking (except the i3-8100 which is a little on the weak side for some games), and they offer great value for money too. The Ryzen 5 2600 is an excellent processor to pair with a GTX 1060. It’s quite a bit cheaper than Intel’s i5-8400 and almost matches it on performance when gaming (in fact, when overclocked it often performs better). This a great CPU for multitasking and streaming too because its 6 cores and 12 threads. The only reason I would recommend the Intel i5-8400 over this processor is if you will be primarily gaming and don’t want to overclock the CPU. This is because the i5-8400 is usually a little bit better than a non-overclocked Ryzen 5 2600. But other than that, you will probably be better off with the Ryzen. This CPU paired with a GTX 1060 should have no problem getting at least 60 FPS even in highly demanding AAA games. and a lot of the time you should be getting more than 100 FPS. The video below gives you an idea of how well the GTX 1060 and Ryzen 5 2600 performs in various games. Below you can find the specifications for the AMD Ryzen 5 2600. The i5-8400 is usually slightly more expensive than the Ryzen 5 2600. It does perform a little bit better in most games than the Ryzen, but only when the Ryzen isn’t overclocked. The Ryzen is also a better choice for multitasking and streaming. Considering all of this, I would recommend only choosing this CPU over the Ryzen if you won’t be doing much multitasking/streaming, and don’t want to overclock your CPU. As I mentioned, when it comes to performance, this CPU is slightly better than the Ryzen 5 2600. Paired with a GTX 1060, you should get at least 60 FPS in AAA games pretty much all of the time, and you should be close to 100 FPS a lot of the time too. The video below gives you an idea of how well the GTX 1060 and Intel Core i5-8400 performs in various games. Below you can find the specifications for the Intel Core i5-8400. If you’re on a tight budget, the Intel Core i3-8100 is worth checking out. If you only play games which aren’t particularly CPU intensive then this processor will handle them no problem and you should always stay above 60 FPS. However, some more CPU intensive games will struggle to stay above 60 FPS with this processor. The other problem with this processor is that it isn’t very future-proof and you will likely want to upgrade it fairly soon, especially if you like to play new games. For most people, I wouldn’t recommend this processor if you have a GTX 1060 which is a fairly powerful card. But if you really don’t want to spend a lot, it isn’t the worst option, especially if you don’t regularly play CPU intensive games. Before purchasing this card, you should definitely check the benchmarks to see how well it can run the games you play the most. The video below gives you an idea of how well the GTX 1060 and Intel Core i3-8100 performs in various games. Below you can find the specifications for the Intel Core i3-8100. The three cards above are great options for a GTX 1060 that shouldn’t cause any bottlenecks in your build (except perhaps the i3-8100 which is a little bit weak). However, if you plan on upgrading your graphics card any time soon, you might want to think ahead and purchase a more powerful CPU now so when you upgrade your CPU won’t be a bottleneck. 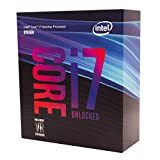 If you want to spend a bit more on a CPU that will last a long time, check out either the Ryzen 7 2700x or the Intel Core i7-8700k. In most games, the GTX 1060 will hold these processors back. However, if you turn the graphics settings all the way down, you should be able to get a very high frame rate which can be great for fast-paced gaming if you have a monitor with a high refresh rate. But the main advantage of these cards is that they should last for years to come. NerdsPick.com is a technology blog dedicated to providing helpful buyer’s guides, reviews, tips and tricks on all things nerdy.